The Sony PCM-D10 is a portable high-resolution linear PCM audio recorder offering versatile recording and playback configurability for musicians, sound recordists, podcasters, and more. Its onboard stereo microphones can be positioned in XY for capturing instruments; Zoom, for documenting speeches; or Wide Stereo for recording ambience and nature sounds. Dual XLR-1/4" combo inputs accommodate mic- or line-level sources, and feature independently selectable 48V phantom power. A 3.5mm TRS input is provided for connection of an unbalanced microphone or mixer feed. The integrated dual-path limiter prevents distortion by automatically replacing clipped sections with a safety signal recorded at a lower level. Record in uncompressed WAV format at up to 24-bit / 192 kHz, or in MP3 format at up to 320 kb/s. The 16GB of internal memory ensures plenty of recording time out of the box, while the memory card slot allows up to 256GB of storage via SD/SDHC/SDXC cards (available separately). Use the 5-band equalizer to enhance the playback sounds, change the pitch, and even adjust the speed without altering pitch. The PCM-D10's built-in Bluetooth capabilities allow it to stream playback to a Bluetooth monitoring system, and enable its app-based remote control from your mobile device. Power the PCM-D10 with the four supplied AA batteries or via a USB Type-C connection. It includes a windscreen, one USB Type-C to USB Type-A cable, a carrying pouch, and a license for Sound Forge Audio Studio 12 editing software. Record uncompressed, high-resolution audio at up to 24-bit / 192 kHz. Whether it's your live music set, a new podcast episode, or a breaking news report, the PCM-D10 unlocks a new level of detail and texture. The onboard stereo microphones feature low noise, a wide frequency range, and three recording positions. Choose XY for music performances, Zoom for interviews and discussions, or Wide Stereo for open and outdoor spaces. Connect two external sources such as mics, keyboards, or mixer outputs to the dual XLR-1/4" TRS combo jacks. These jacks are separately switchable between mic or line level, and have independent 48V phantom power and secure push-lock jacks. You'll also find a dedicated stereo 3.5mm mini-jack input. 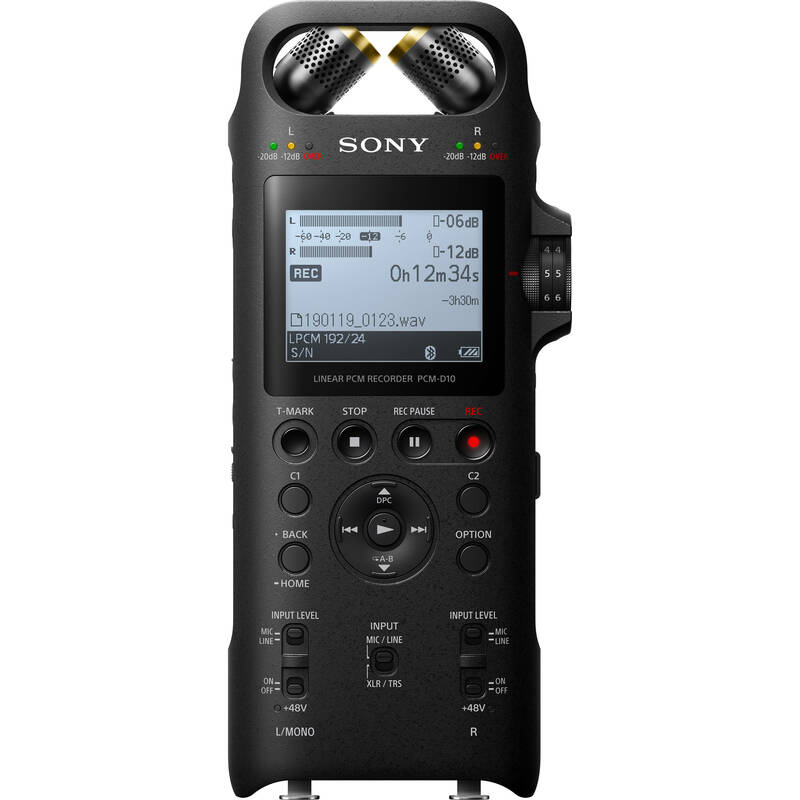 Combining two top-of-the-line AK4558 AD/DA converters with Sony's proprietary technology, the PCM-D10 maximizes the signal-to-noise ratio, and allows you to capture detailed, accurate audio at up to 192 kHz. Beneath the case of the PCM-D10 is a circuit board engineered to maintain uncompromising sound quality. The analog and digital circuits are completely separated on the board, reducing interference and boosting the signal-to-noise ratio. Also, the amp blocks are positioned close to the inputs for the clearest possible transmission. Whether you're monitoring live or reliving the performance, you'll enjoy clear, detailed audio and high output power from the PCM-D10's MAX9723 analog headphone amp. This also features an integrated analog volume controller for smooth adjustment. With the high S/N mode, you can stop worrying about lost low levels. The PCM-D10's two ADCs record at different volumes (one regular and one lower); if any low levels are lost, the device automatically replaces these sections with audio captured at -12 dB. The result? Clear recordings for even the most dynamic performances. The PCM-D10's digital limiter lets you make interruption-free recordings even at high levels. When distortion occurs, the recorder will automatically fill clipped portions with a back-up recording at a lower level. This means that even if volume spikes, you can be confident you've recorded distortion-free files. Choose from different power supply options to match your recording environment. USB Type-C can be more suited to studio time, while dry cell batteries are ideal for recording in the field. With 16GB of internal memory, you're always ready to lay down high-resolution recordings. Recording time can be expanding without lowering audio resolution by adding up to 256GB of SD-card storage. Plus, if you turn on Cross-Memory REC mode, the recorder will automatically switch to SD card when you exceed the internal memory. An easy-to-read, on-screen, backlit display shows separate peak levels for left and right channels, so you can see just where you need to tweak your inputs. Three peak level lamps will light up to indicate if your levels hit -20 dB, -12 dB, or overload. You can also monitor full-bandwidth stereo levels on the display or via the Sony REC Remote app. Use the Sony REC Remote app (available for Android and iOS) to start recordings from your smartphone. This helps eliminate the interference sometimes caused by jogging the device when you hit the REC button. You can also use the app to adjust most recording settings, mark tracks, and monitor your levels. Recording an interview? Simply switch from stereo to monaural mode and the PCM-D10 will record on only the left channel when an XLR cable is connected. Recorded your raw audio? Connect the PCM-D10 to your computer via included USB Type-C to USB Type-A cable, then import the audio files to work your editing or post-production magic. Included as a download link and serial number is Sound Forge Audio Studio 12, software that's ideal for cleaning up your interview audio or enhancing your band's performance before you share it with the world. The PCM-D10 is designed with a simple, intuitive button layout, so nothing comes between you and capturing the perfect recording. Plus, there are two custom buttons you can assign to modes such as high S/N or the digital limiter, giving you a shortcut to the operations you use most. Thanks to the 1/4"-20 tripod screw hole, you can easily and securely mount the PCM-D10. The PCM-D10 is finished with a tactile, plot-painted texture. This helps you keep a firm grip on the recorder. The PCM-D10 comes with a windscreen, which is designed to reduce wind noise when you're working in the field. it looks like this one is not only larger than the d100, it lacks dsd recording. so where does it sit in the lineup--above or below the d100?